Tumbled glass has a definite appeal: It’s eye-catching, has a pleasant variety of colors, and feels nice in the hand. And making it just takes time, and repetitive motion – throw some glass in a rock tumbler for about a week and voila – what comes out is better than what came in. But it’s also ultimately just glass. The social apps we use every day are starting to look a lot like tumbled glass. If you subscribe to the notion that imitation is the sincerest form of flattery, this past week has made Facebook the sincerest technology company in existence, and Snapchat the most flattered. On Tuesday, Instagram launched Stories, which didn’t even bother changing the name of the product it was copying, Snapchat Stories. Facebook-owned Instagram wasn’t shy about the similarity, either: Instagram CEO Kevin Systrom freely gave Snapchat credit for the concept, which if you’re out of the social loop, involves letting users post photos and videos strung together in a “story” that expires after 24 hours. 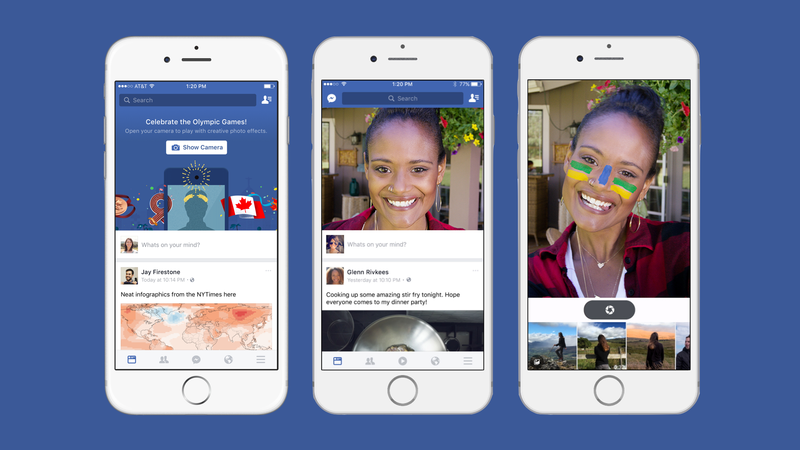 Then, on Friday, Facebook proper began testing an experiment whereby the mobile app opens directly to a camera window atop a user’s feed, which makes use of Facebook acquisition MSQRD’s selfie filters for an Olympics tie-in. Sure, it’s a special case tied to a specific event, and available only in Brazil (makes sense, Olympics are there) and Canada. Canada is the more interesting component, because the great white north is normally where companies run tests ahead of big U.S. rollouts, since the market is so similar but low-risk due to its much smaller size. Opening direct to a camera definitely drives that kind of engagement, especially with younger audiences. We know that because that’s how Snapchat works. Which is where Facebook got this idea. In an interview with The Verge, FB product manager Sachin Monga explained it’s designed to give everyday users “this magical AR experience.” It’s no Systrom-style shoutout, but Snapchat is widely regarded as pioneering broad consumer use of augmented reality through its own dynamic selfie filters. These two examples so close to one other in time would probably be enough to make my point, but TechCrunch’s Josh Constine also found out that Facebook had fully built but then scrapped the launch of a Snapchat Stories clone on Facebook itself. Meanwhile, it’s not entirely a one-way street. 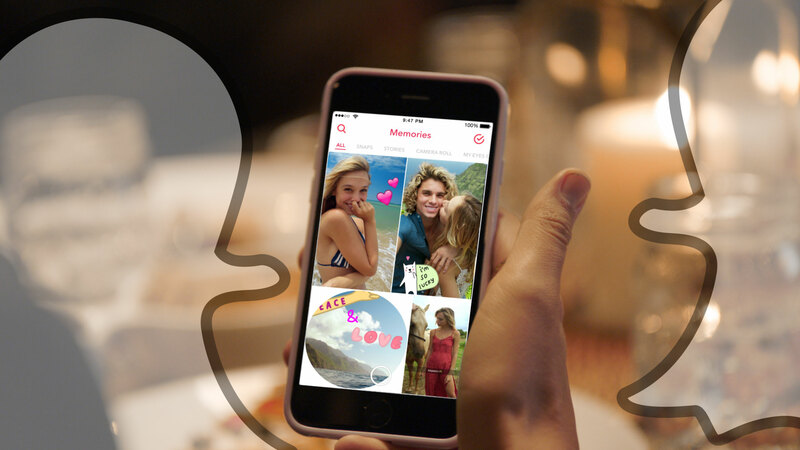 Snapchat launched Memories earlier this month, which is a pretty directly comparable offering to Facebook Moments. It not only brings some Facebook style permanence to a social network that perviously leaned heavily on ephemerality, but it also introduced the ability to pull content from your camera roll to snap, which allows brands and publishers to treat it more like Facebook and Instagram as an audience engagement channel. I’m all for refinement, and I don’t think any technology company is wrong for identifying an effective interaction model or product, and trying to make it even more effective, or better suited to their own audience: That’s how we get nice things. But I can’t escape the feeling that the social space is starting to feel like so much tumbled glass, with a lot of retread and few new paths. Sure, with more novel efforts, we’ve had some goofs. Beme. Peach. Twitter (I kid, sort of). It’s a list that includes some companies with a lot of early excitement, and founders who should know a thing or two about social. At least, though, they had some sharp edges, and it’d be nice to see a few more of those coming from the players who can stand to absorb the most risk.